Turnberry Village features three developments totaling 316 single-level apartments with individual private entrances. 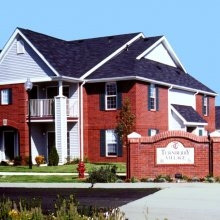 A total of 228 units are full market rate housing with 1-4 bedroom floor plans available. A total of 88 units have income restrictions and applicants must meet program requirements. Married students and students with children are welcome. Spacious single-level apartments with individual private entrances, covered patios and balconies. Energy efficient total electric heat and central air conditioning. Modern kitchens with dishwasher, refrigerator, range/oven, disposal, oak cabinets, breakfast bar and pantry.